With war looming over Britain in 1939, the British Government commissioned Keep Calm and Carry On posters to try to calm fears. Today, everything from posters to Keep Calm shirts are hugely popular in Britain and elsewhere. The timeless British design and motivating slogan gives people reassurance when used in home decor or office decor. 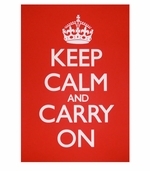 We offer the Keep Calm Carry On poster framed and unframed. The posters are turning up as wall decor in the most interesting places. 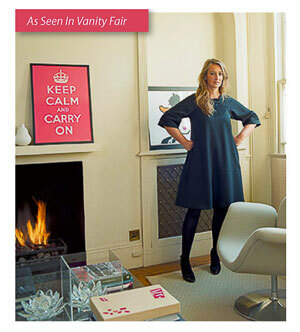 Vanity Fair featured a Keep Calm and Carry on poster in Anya Hindmarch's living room. 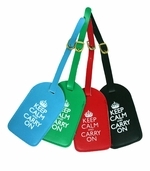 All of our Keep Calm and Carry On items come with a postcard telling the history of Keep Calm posters. We ship same or next business day. Gift wrap is free. With war looming over Britain in 1939, the British Government commissioned Keep Calm and Carry On posters to help the fearful populace be calm. Today, prints of the keep calm poster are hugely popular in Britain and elsewhere. The timeless British design and motivating slogan gives people reassurance when used in home decor or office decor. The posters are turning up as wall decor in the most interesting places. 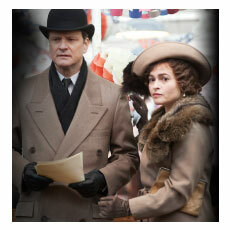 Vanity Fair magazine featured a Keep Calm and Carry On poster in Anya Hindmarch's living room. Keep Calm and Carry On sums up in a nutshell what the British did to get through WWII. Interestingly, Churchill's favorite slogan was not Keep Calm and Carry On. 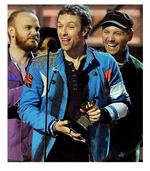 It was "Keep Buggering On." Churchill was known for the long hours he put in. Churchill was in his seventies during the war but his goal was to pack a day and a half's worth of work into a day. He had many secretaries and unlike Roosevelt, Hitler and Stalin who gave orders verbally, Churchill insisted on putting all of his orders in writing. Not exactly a WWII poster but very much in the Keep Calm and Carry On vein, a famous sign in shops in London after the war was: WE NEVER CLOSED. Everyone from Churchill to the shopkeepers were proud that they were able to be calm carry on and win the war in spite of the constant bombing in London. 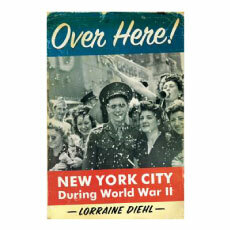 Lorraine Diehl's book, Over Here, is about New York City in WWII. Diehl talks about the can do spirit of New Yorkers. Besides all the brave men who enlisted, patriotic New Yorkers who remained stateside during WWII pitched in too. Some of the WWII propaganda posters in New York read things like: "Bundles for Britain," "Now is the Time to Aid Britain," "Buy Defense Bonds and Stamps Now." Saks Fifth Avenue sold Victory Bonds on the first floor under a WWII propaganda poster that read "Victory, Now You Can Invest in It." In New York, a city of lights, perhaps one of the biggest issues was turning out the lights during scary air raid warnings. In Times Square, fantastic billboards were created with smoke rings coming out of them to make them eyecatching, instead of lights. These efforts show the ingenuity of New York ad men. The billboards were the New York version of British Keep Calm and Carry On posters. The King's Speech does a wonderful job depicting how much the King and Queen were needed for inspiration in British history during WWII. Bertie (aka King George VI) and Elizabeth took the words "Keep Calm and Carry On" to heart and set an example for the people of England. Keep Calm and Carry On posters were designed by the Ministry of War to advise the public to stay calm. But as the movie shows, the Royal Family also heeded the advice. The royal family had marks on their baths to show how far they could fill them in wartime and food was rationed even at the palace. You can see an original Keep Calm and Carry On poster in Winston Churchill's rooms at the Imperial War Museum. 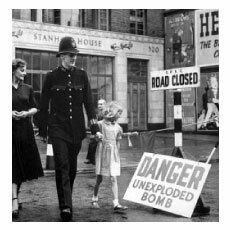 The recreated WWII rooms are quite interesting and really capture the terror of wartime London with reenactments of Bomb alarms and recordings of broadcasts. No matter how stiff the British upper lip was and even though the royalty and Churchill encouraged everyone to keep calm and carry on, it was a scary period of history. Stephanie Clifford wrote an article entitled Calming Signs of Troubled Past Appears in Modern Offices. ", about the Keep Calm Carry On poster in executive offices. She mentions the offices of David Lubars chairman and creative officer at BBDO North America; Edward Menicheschi, Vanity Fair publisher; Reto Gregori, Bloomberg News chief of staff; Peter Macey Wired ad sales director; the headquarters of the branding firm Redscout; and the copy department of Business Week. "It looks quiet and sort of stiff-upper-lippey," Mr. Lubars said. In a recent UK Independent article about Ben Bradshaw, the Secretary of State for Culture, Media and Sport, the author visits Bradshaw's office and we learn that: A "Keep Calm and Carry On" poster is Blu-Tacked to the back of his door. 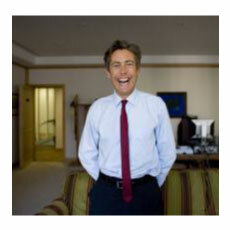 See: Ben Bradshaw article at Independent.Co.UK." The Today Show featured our Keep Calm & Carry On cups and cocktail napkins (n.a. - although currently we do not sell these anymore we have a wide range of cocktail napkins you may choose from) on their Royal Wedding party watch. 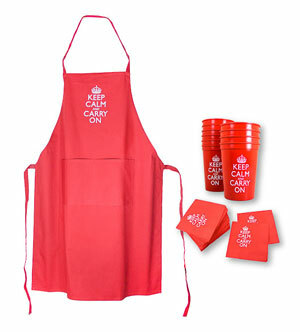 After your party, we suggest our absorbent and cheery Keep Calm and Carry On kitchen towels and aprons to help you clean up. 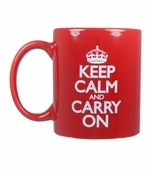 Morning Joe The hosts of MSNBC's Morning Joe, Mica and Joe use our bone china Keep Calm and Carry On mugs. We love their empathetic approach to news. Read all about Morning Joe commentary Keep Calm and Carry On at the Village Square. The Huffington Post also blogged about Morning Joe using the Keep Calm slogan. Decorative Things contributes 20% of sales of its framed and unframed pink Keep Calm and Carry On posters, pink bumper stickers and pink tote bags to The Anne Moore Breast Cancer Research Fund at Weill Cornell Medical College. See our Pink Things section. 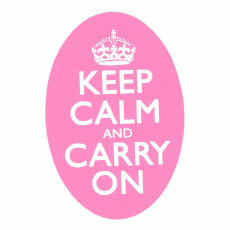 Keep Calm and Carry On is an inspring message for cancer survivors and their families. Actually it is a kind get well message to offer to many unwell people. The author said: The sales staff during a Barney's show sale, "for the most part, unusually brave and sporting through this blitz, was seemingly guided by an invisible Royal Air Force poster reading: Keep Calm and Carry On." See New York Times Fashion Article . Wikipedia has a Keep Calm and Carry On page. 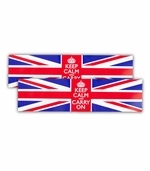 Visit our What is Keep Calm and Carry On from page and our Keep Calm Gallery to see our posters, mugs, bumper stickers, t shirts, tote bags, aprons, kitchen towels and more in use. July 5th, 2009, The New York Times had an article about remixed messages of the Keep Calm slogan. Our Now Panic and Freak Out mugs are an example. The UK Guardian calls the Keep Calm Carry On Poster the "pin up of our age." We're not sure how you found us but we're glad you did! We see people googling all sorts of iterations of the phrase like: be calm and carry on, keep calm carry, and keep calm and carry in. However you found us, welcome!